Combine the awesomeness of Apple's Siri voice recognition capability with ability to tap into it using SiriProxy, and our favorite hacker friendly mini Linux computer Raspberry Pi and we have an excellent voice controlled home automation system which runs 24/7 waiting for voice commands to do assigned tasks. To get this super-geeky project working we need to install and configure SiriProxy on our Raspberry Pi setup, follow the instructions shared below to install SiriProxy on the official Raspbian “wheezy” distribution. Make sure you are running root. Make sure you have SSH working with a Static IP. file by adding the lines below for intercepting the requests to Apple Siri server and route them through our locally running SiriProxy handler. Make sure you use your RPi static ip instead of [CHANGE_TO_YOUR_RPI_STATIC_IP] shown below. 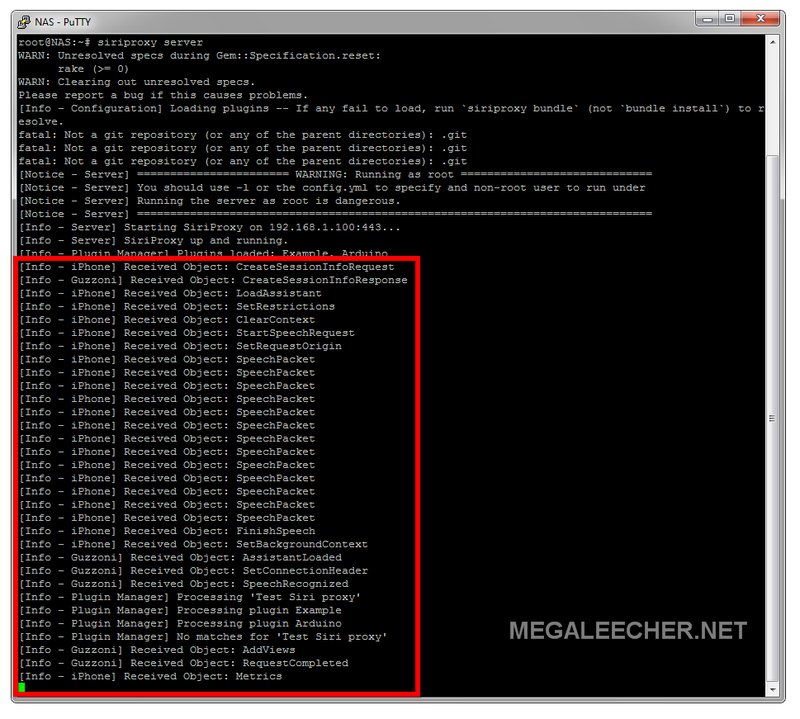 , this will take quite a while. Generate the certificates for our iPhone to fake Apple SSL. 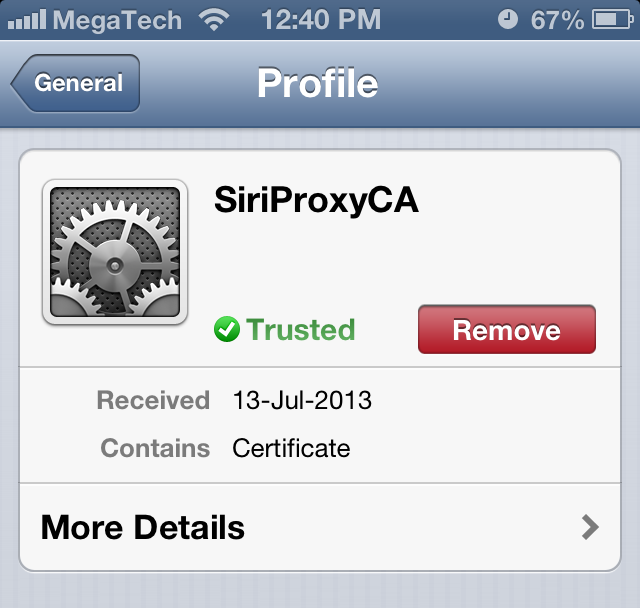 Transfer this certificate to your phone (it will be located at ~/.siriproxy/ca.pem) by emailing it and opening the email on your phone. On the iPhone simply tap the email attachment and follow the prompts to install. Configure your iPhone WiFi to use our DNSMasq server installed on Raspberry Pi by navigating to Settings->WiFi->[Your WiFi Access Point Name]->DNS, change this to your Raspberry Pi static IP. and it should look like this ready to listen for commands. To test, launch Siri on your phone and speak test siri proxy. The terminal window running SiriProxy will show activity capturing the request and reply with Siri Proxy is up and running!. To stop the server type CTRL+C at the terminal. Thanks for sharing this, I was wondering is there anything similar on Android. 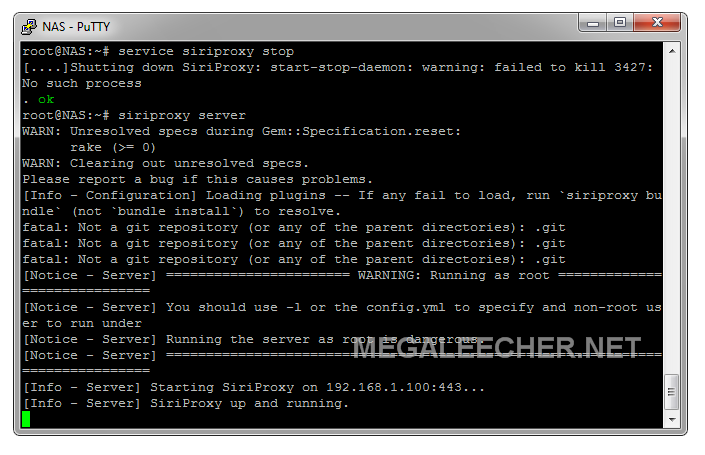 I mean "Siriproxy for Android" ?